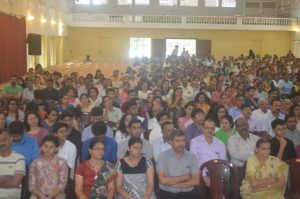 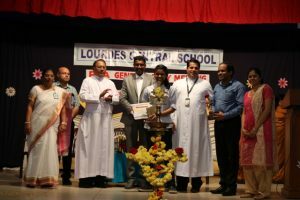 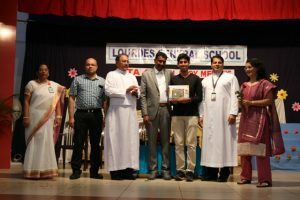 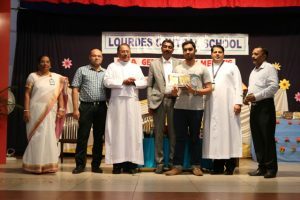 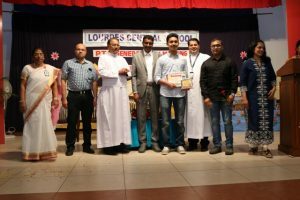 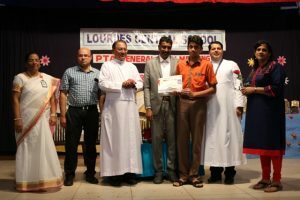 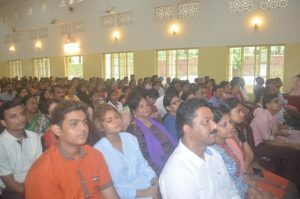 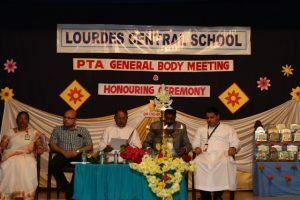 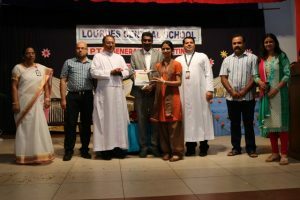 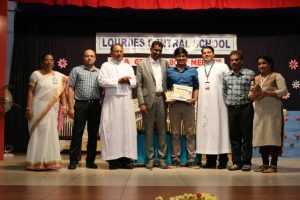 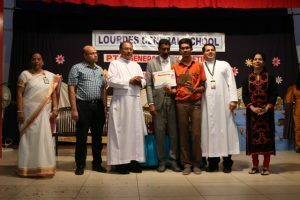 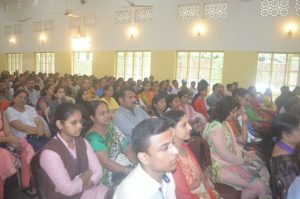 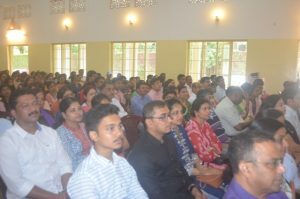 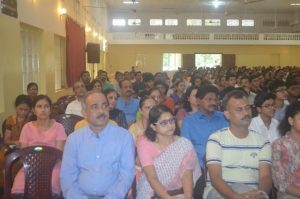 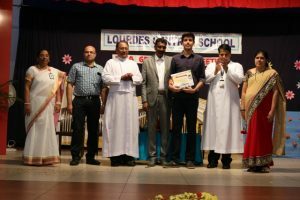 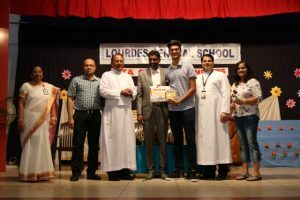 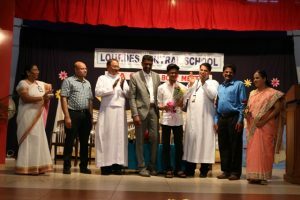 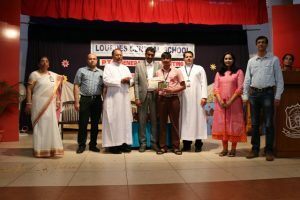 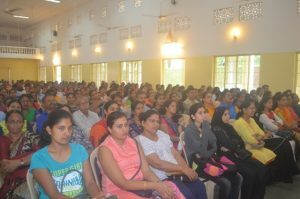 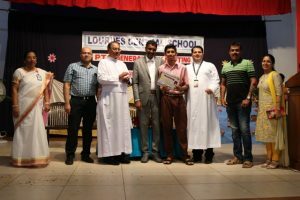 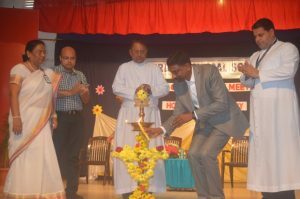 The General Body Meeting and the Honouring Ceremony of the Toppers of AISSE and AISSC conducted by the CBSE Board of India for the academic year 2017- 18 at Lourdes Central School was held at Bejai Church Hall at 9.30 a.m on 24th June 2017. 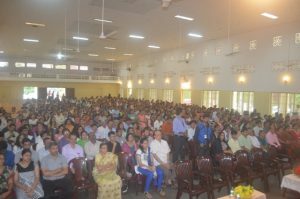 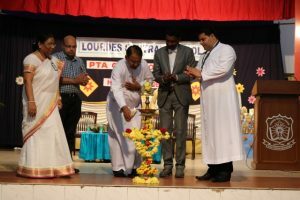 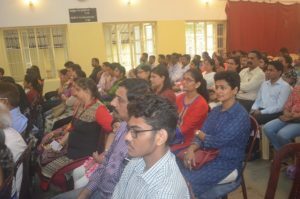 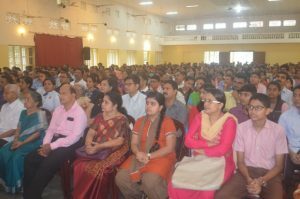 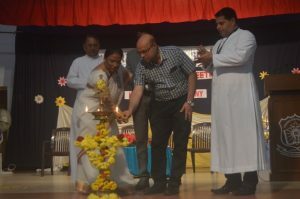 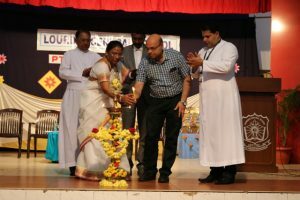 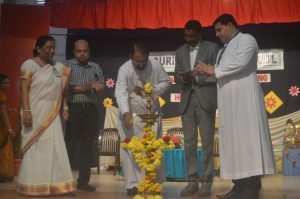 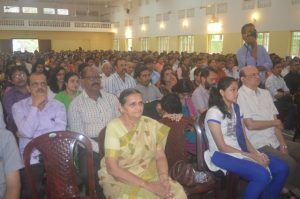 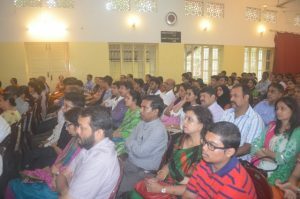 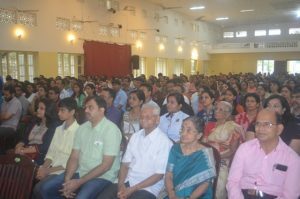 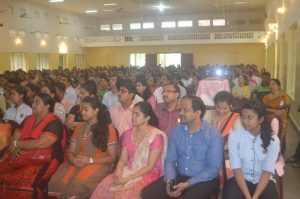 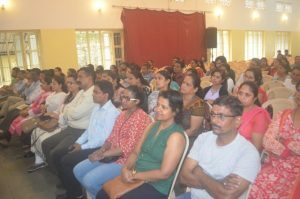 The parents were welcomed by the faculty member, the compere of the show, Ms. Dilla Colaco opened the gathering with the standing ovation and a thunderous applause to all the dignitaries as they entered the Bejai hall. 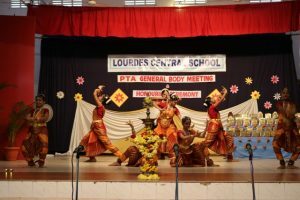 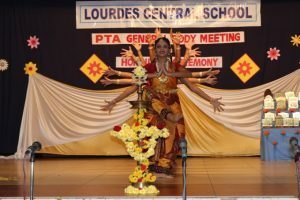 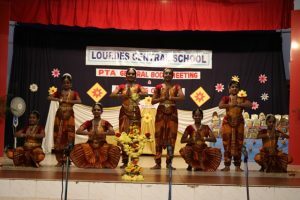 The invocation began with a welcome dance by our Lourdites, which brought the inner most feelings in the form of Bharatnatyam Dance. 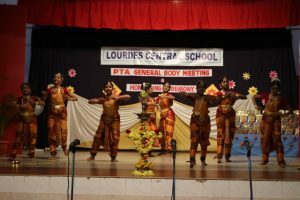 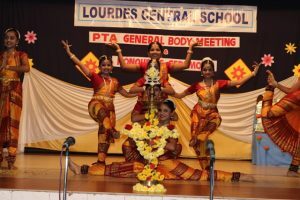 It was well choreographed by Mrs. Nandini and Mrs. Linette. 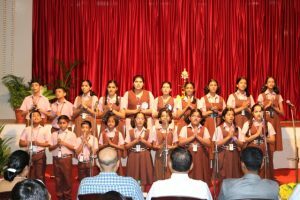 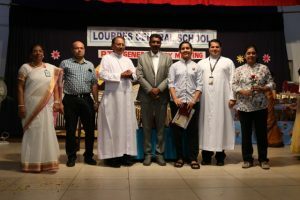 “All that has been and that is and all that will ever be is Gods alone and for His glory”, was devotionally sung by the school choir which was led by the Music Maestros Mr. Ivan Mascarenhas. 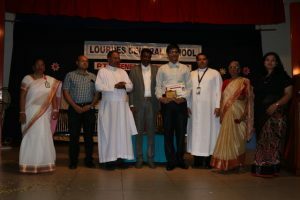 The Principal Rev Fr. 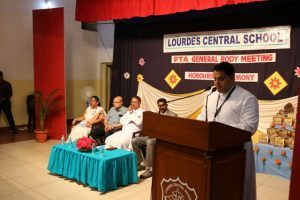 Robert D’souza with his illuminating ideas and vision inspired the gathering with a warm welcome and also introduced the Chief Guest who was his mentor and guide when he was doing his post graduation in Political Science. 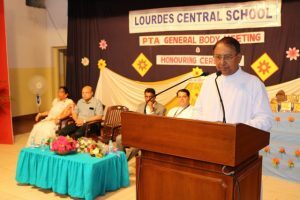 In his message the Principal stressed upon students hard work along with the guidance of parent and teacher which will help today s hundred percent result otherwise it would not be possible. 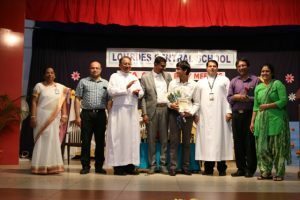 He gave a bird’s eye view for the development of LCS. 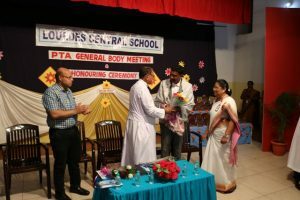 The Chief Guest, Professor Dr P L Dharma was honoured by our Manager with a shawl and flowers. 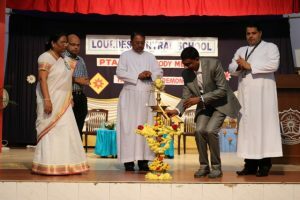 The dignitaries on the dais lit the lamp which signifies knowledge which is one of the greatest forms of asset. 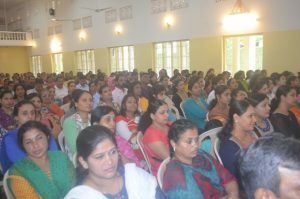 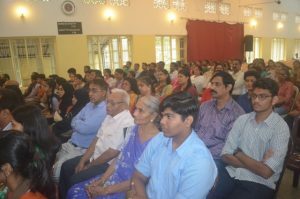 The Chief Guest Professor Dr. P.L.Dharma, Chairman of the the Department of Political Science, Mangalore University, a renowned educationist, addressed the gathering with the words of wisdom such as values like faith, love, respect and discipline of another which will bring a total change in the mindset of Younger Generation. 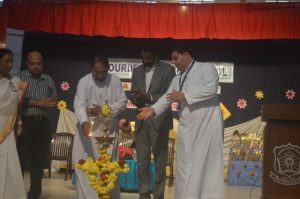 Religion should remain in our hearts and not exhibit outside for our selfish motives. 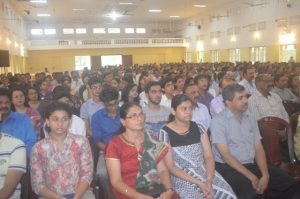 He emphasised that all institutions should build students not only with academic results, but instil in them values which we can cherish for our lifetime. 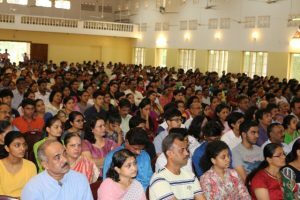 He asked the young and old parents to build a generation of not only technology, but the true sense of life and our Mangaloreans proud of. 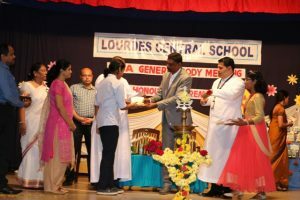 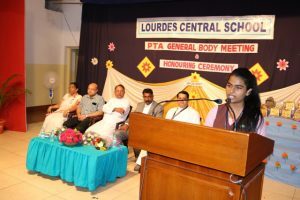 The erudite Chief Guest complimented the students who secured 100 percent results in Class X and Class XII. 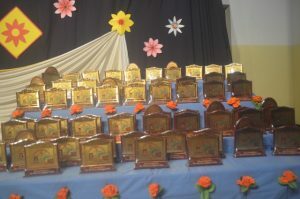 They were 40 students for Class X with CGPA 10 points and in Class XII they were 19 students. 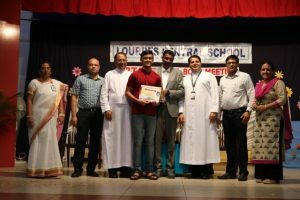 The Best Outstanding Student award was also given by the dignitaries. 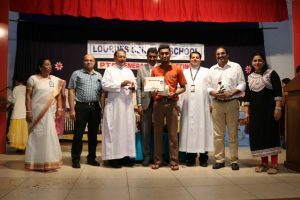 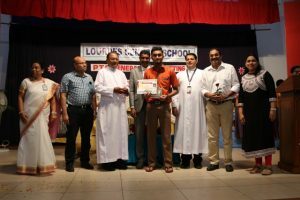 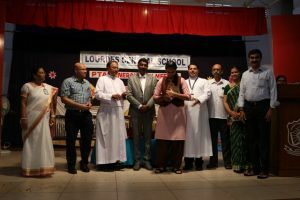 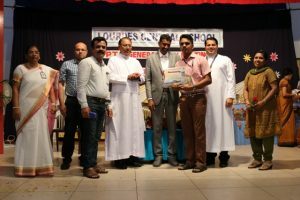 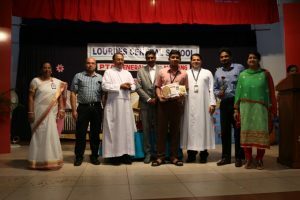 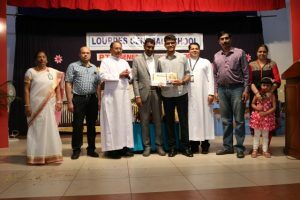 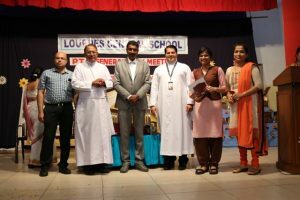 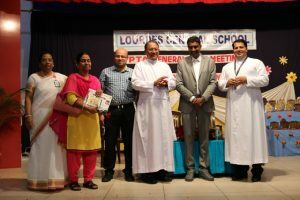 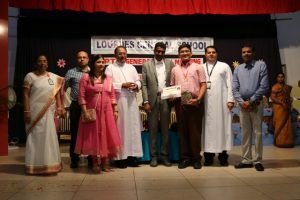 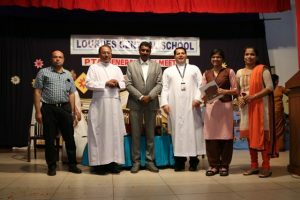 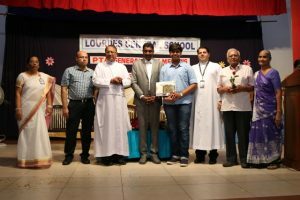 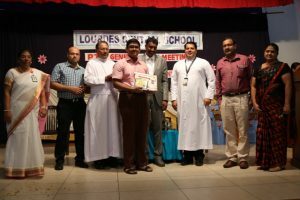 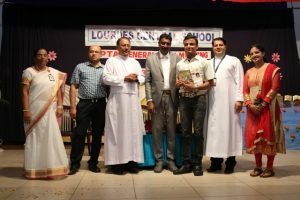 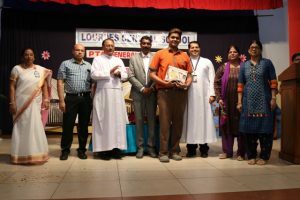 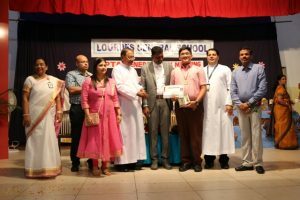 The Manager Rev Fr Wilson Vitus Dsouza, a man of simplicity, compassion and love stressed upon the parents that they should touch the hearts of the children. 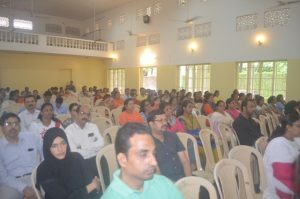 He said mothers play an important role specially a mother is equivalent to 100 teachers. 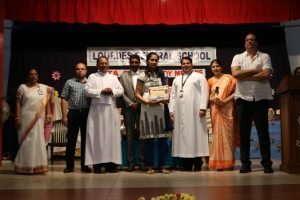 Home is a place where the child does her first education and builds up one’s character. 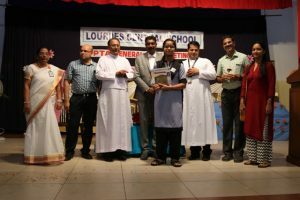 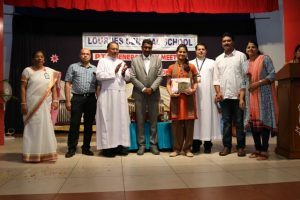 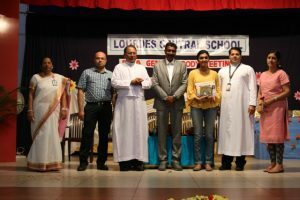 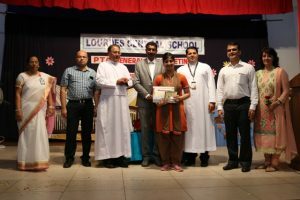 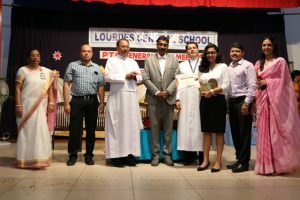 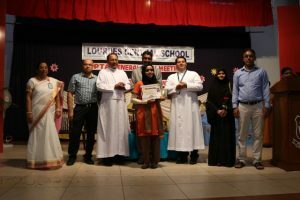 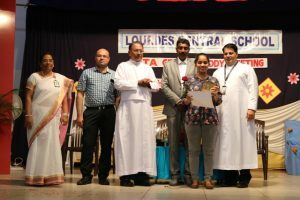 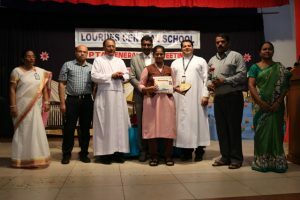 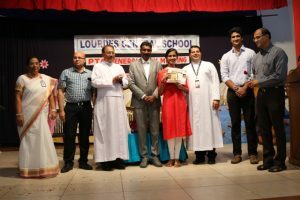 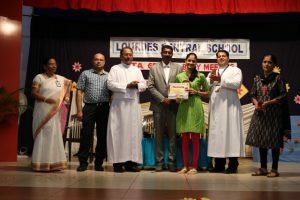 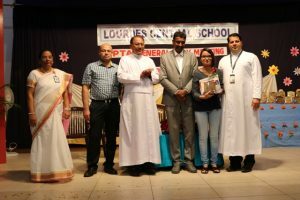 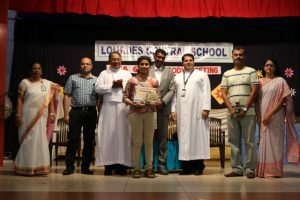 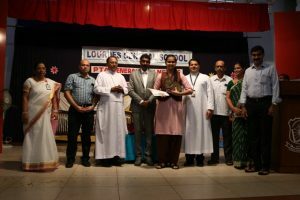 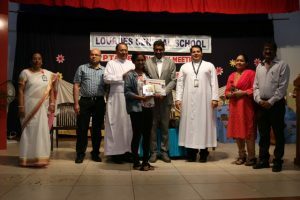 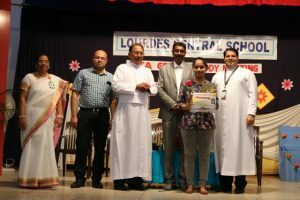 The outstanding Students of Class X Ms. Eva Jessica Dsouza spoke about her feelings towards her school and Ms Roshini Shetty shared her success story with words of gratitude for her teachers’ right from Kindergarten to Class XII. 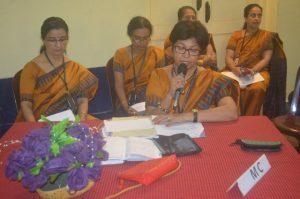 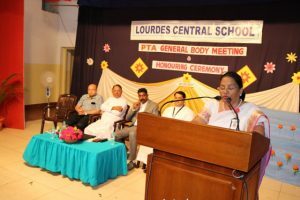 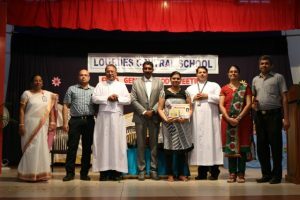 The Vote of Thanks was delivered by Ms Belita Mascarenhas, the Vice Principal with the note of goodwill and assurance to mould students under the guidance and mantle of the Management and her band of teachers. 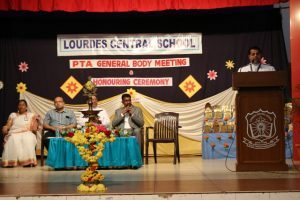 The First General PTA Body Meeting ended with the singing of the National Anthem by the gathering and the Staff of LCS.